Mentry picked up the hobby in second grade when she saw a twirler named Haley in Emerald Isle, NC. She fell in love with twirling the moment she saw it. “I was awestruck at everything she did. All I could think about was how much that I wanted to be just like her! Haley was so kind and taught me some basic skills. That year, as I went to second grade, I got a flyer one day for baton twirling lessons in our area. I think that it was totally meant to be! I signed up instantly to start classes, I have been obsessed ever since!” Mentry said. Mentry is a member of a team known as the Royalettes. This is her third year as a member of the team. They were team finalists this year at nationals, making them one of the top five teams in the country. Over the course of her time there, she has developed relationships with her fellow twirlers and coach, Diane Gunnels. “[Gunnels] is an incredible coach and beside that, she is one of the kindest, most amazing people I have ever met. Most of my teammates have been Royalettes since they were two or three years old. However, I joined the Royalettes when I was 13 and have finally caught up to them! The Royalettes are amazing, and we are a very close team,” Mentry said. In recent years, Mentry has added several trophies to her case. Currently, she holds over twenty individual and team states titles, including two international titles in One-Baton and Rhythmic Twirl, her two favorite events. This year at nationals, Mentry defeated forty other state-winning twirlers in order to be crowned Intermediate Junior Miss Majorette of America, a title she worked hard far. “Hearing my name announced through the arena filled with thousands of people was the best moment of my life!” Mentry said. 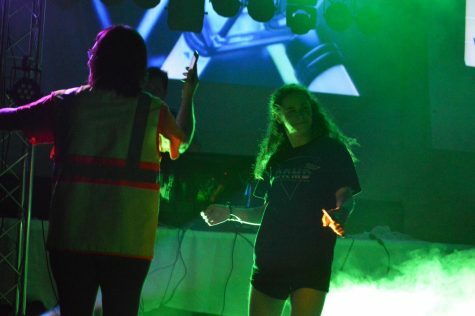 Mentry began twirling for the school during her eighth grade year in 2016, and she started off on the right note. In her first two performances, she was nearly flawless, rarely dropping the baton. Mentry has performed at pep rallies, parades with the band, DRMD, and football games. In previous years, she has performed at the Pink Out, Senior Night, and homecoming games. At the Senior Night and homecoming games, she impressed the crowd by setting her batons on fire. Before she performed this stunt, however, Mentry practiced her routine for hours, perfecting her routine. “I practice every single day! I actually practice with batons about four or five days a week, but I also do other things to help me train. I participate in cheerleading and tumbling to help with gymnastics stunts under tosses, dance to perfect my movements, and cross-fit and personal training to get stronger. I stretch and do strength training by myself for 1-2 hours every day to stay flexible and strong,” Mentry said. Mentry has quickly become a fan favorite at the school, evoking loud roars from the crowd. After her performance at the homecoming football game, the student section began cheering her name. She is thankful for the love that she receives from the school community. “It truly is an indescribable feeling! 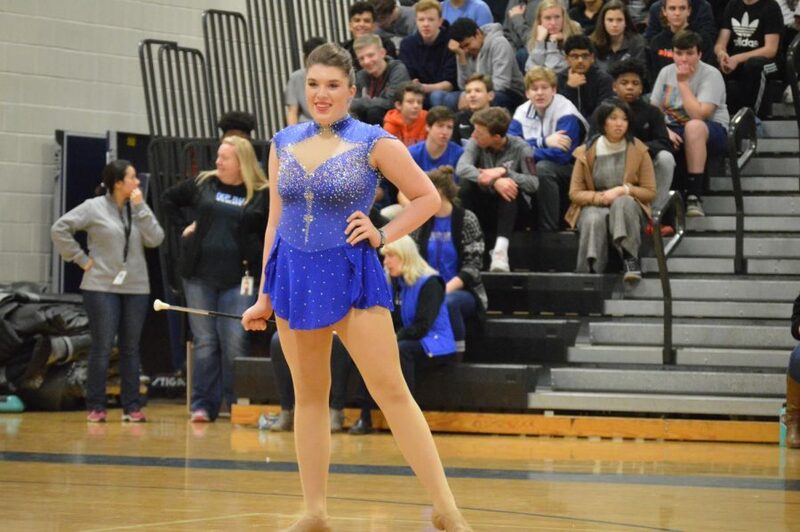 At Deep Run, I went into my first performances knowing that twirling was unique and that people may not love it like I do. I couldn’t have been more incorrect. People seem to absolutely love it, which just inspires me to do more each performance. So many people have reached out to me, and we have become friends over a simple message! I always love talking to people and would love to talk to anyone who has questions or wants to try twirling!” Mentry said. After high school, Mentry currently has three goals she is trying to achieve. She wants to make Team USA and represent the US at the World Championships or the Grand Prix. In addition, she aspires to make semifinals in the Grand National Twirling Championships and/or to win College Miss Majorette of America, which is the highest honor in the National Baton Twirling Association. Her final goal is to twirl in college in a huge stadium on front of thousands. At the moment, her top choices are Florida State, USC, Virginia, and Georgia. “It would be an absolute dream to represent my college with a band, and that is what I started twirling in order to do!” Mentry said. Such a unique talent is often overlooked. However, Mentry has become a fan favorite at football games and pep rallies. With over two years left in her high school career, she has already become an internationally-recognized twirler. The sport has given Mentry the opportunity to connect with new people, especially the school community.